Officers beat, falsely charge victims of another Hindu extremist attack, Christians say. HYDERABAD, India (Morning Star News) – Six Christians facing false charges, two of them beaten by police, were jailed for a month for praying for a sick woman in eastern India, they said. After tribal Gondi villagers in Simdega District, Jharkhand state, attacked the Christians on Sept. 16, officers at the local police station refused to listen to the victims and hit two young men among them, 25-year-old Sajan Majhi and Kalender Majhi, 20, they said. The police beating followed the thrashing the Christians received from Hindu extremists in Ghosra village, who attacked them while they were praying for healing for the wife of Bikhru Majhi, sources said. Officers jailed the Christians and charged them with “promoting enmity between classes” and insulting religion. They spent a month in jail before being released on bail. Karketta, the two young men and James Ba, 30, Balmuni Kumari, 19, and Jagdish Majhi, 50, went to the home of Bikhru Majhi after he asked them to pray for his wife, Nitu Devi, sources said. Before winning a battle against cancer, Karketta had visited several hospitals for treatment, exhausting his family’s financial resources, he said. Bikhru Majhi is Hindu but believes Christ can heal, and he routinely invites Christians to pray for his wife, who has long been ill, said Singhray Kullu, former pastor of the church in Ghosra village that the arrested Christians attend. “Bikhru believes the prayers can heal her,” he said. At around 8 p.m. on Sept. 16, a throng of Hindu villagers surrounded Bikhru Majhi’s house as the Christians prayed for his wife, said the only woman among the six arrested, Balmuni Kumari. The villagers were furious, Karketta said. At around 11 p.m., police arrived and arrested the Christians, he said. They were taken to T. Tangar Police Station. 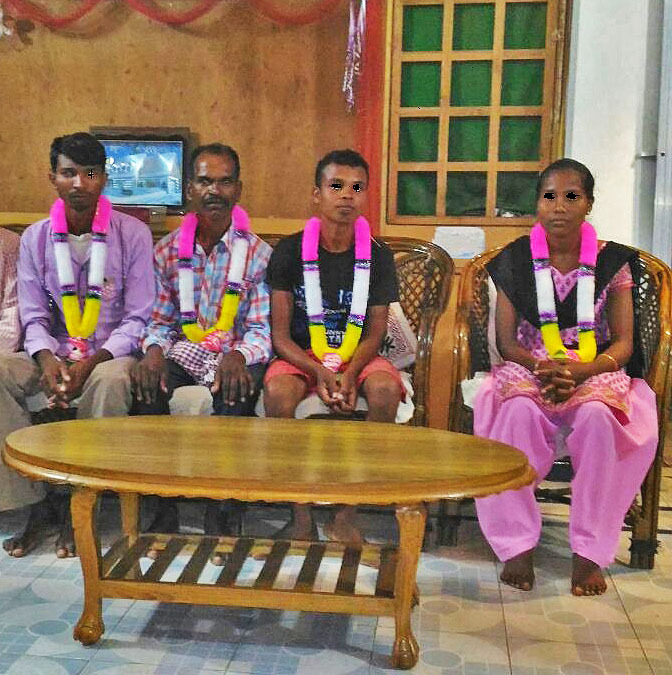 James Ba and Kalender Majhi of Banspahar village, Jagdish Majhi of Latapani village and Balmuni Kumari of Tukupani Baanstoli village were released on bail on Oct. 16. Dasrath Karketta of Khijri village and Sajan Majhi of Farsapani village were released on bail on Oct. 17. The 19-year-old Kumari was arrested along with the others at 11 p.m., though arrests of women are not permitted in India after sunset, a legal expert told Morning Star News. He added that if special circumstances require the arrest of a woman after sunset, police are required to assign female police officer. Her family came under severe pressure from the Hindus extremists while she was in jail, she said. Her brother told Singhray Kullu about the threats in Kumari’s home village. The time in the women’s jail interrupted her university studies, Kumari said. Some of the assailants later apologized to her, she added. The Christians were charged with promoting enmity between classes (Section 153-A of the Indian Penal Code), punishable by up to three years of prison and/or a fine; maliciously insulting the religion or religious beliefs of any class (Section 295-A), punishable by up to three years of prison and/or a fine; and acts done by several persons in furtherance of common intention (Section 34).